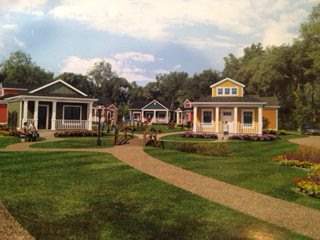 This is an artist's rendering of the "tiny house" village of shops and apartments being proposed by Bagel Basket owner Sean Mitchell. Sean Mitchell stands at the back of the Bagel Basket property, overlooking a wooded lot he owns and intends to convert to a retail/apartment village. YORK, Maine — The northern end of York Village is going to look a lot different next summer than it does today, as a “tiny house” village of shops and apartments is planned to transform what is now a wooded lot. Bagel Basket owner Sean Mitchell can now move forward with this dream, four years in the making, after voters last week approved a zoning amendment that extends the York Village Center Overlay District to include his land next door to the popular eatery. “I’ve been thinking about this for a long time, and I think it will make a very nice addition to the village,” said Mitchell. Four years ago, Mitchell bought the property next door, which at the time included a vacant house. “Our first thought was to fix up the house, but it was sagging and leaning, so the consensus was to tear it down and start from scratch,” he said. The Village Fire Department conducted a controlled burn of the building. Since then, the land immediately abutting York Street has been cleared and is used as a parking area for the Bagel Basket. Mitchell soon focused on a tiny house village for the land, which is less than an acre in size. 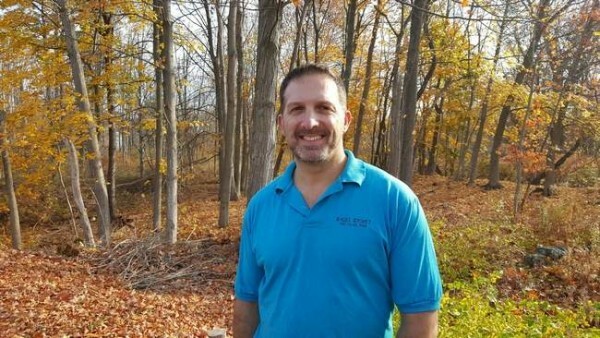 With the land in the York Village District, he can now build to 50 percent density, as opposed to 25 percent under the residential zone the land had previously been in. “I’ve always been interested in small houses, and the tiny house movement has really taken off recently,” he said. The goal is to build as many as six tiny houses, no more than 20 feet by 30 feet in size, each architecturally different. People would park at the front of the property and then walk into the village itself. The first floor will be retail spaces, with a second floor for studio and one-bedroom market-rate apartments. He said he already knows of one business that will be opening there — his wife intends to open a general store. Several established York businesses have also expressed interest in moving there once it’s built, he said. He said he could envision an ice cream shop, a pizzeria, an art gallery and a gift store as other possible businesses there. He is referring to a proposed plan to reconfigure the village to include more sidewalks, bike lanes and green space. Now that voters have approved the zoning change, he said he hopes to be able to break ground this month and certainly by early spring. If not all of the houses are built by next summer, he’d like to see most of them built. “I think it’s going to change the look of the village,” he said.